Oil Slick socks are finished. I'm being a Very Good Girl and knitting the second sock of a pair I started, oh, maybe a couple of years ago. 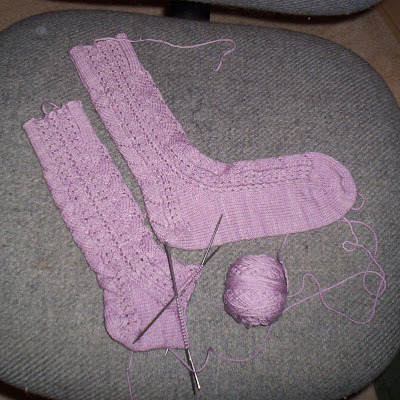 These are the Merino Lace socks from the IK book, but I knit the first one after it came out in the magazine. Of course, I did not make any notes when I knit the first one, so it took me three tries to get the gauge right for the second one.